The Everest phone card is a Permanent PIN card with the handy Refill feature and PIN Free Access option. A Toll Free Access Number is accessible from the US, including Hawaii and Puerto Rico, as well as Canada. 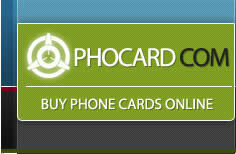 The card offers low long-distance rates to many countries with high quality connection. Enjoy the Everest calling card and get a mountain of benefits! Register your phone number with the card to be recognized automatically after dialing the Access Number, and you don't need to enter a hard-to-remember PIN! Use "My Account" - "My Permanent PINs" to register up to 4 additional phone numbers. Use "My Account" - "My Permanent PINs" to see the card's balance and other reports. For questions regarding connection quality please contact Card's Customer Service (the number is provided in the same email with Phone Card's PIN and Dialing Instructions).